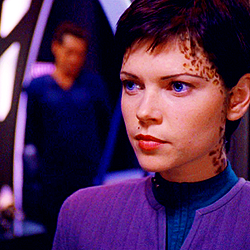 Ezri Dax. Copyright holders: CBS. Wallpaper and background images in the nyota Trek: Deep Space Nine club tagged: photo icons ds9 ezri dax ezri nicole de boer nicole deboer. This nyota Trek: Deep Space Nine fan art might contain tamasha, picha, headshot, and closeup.